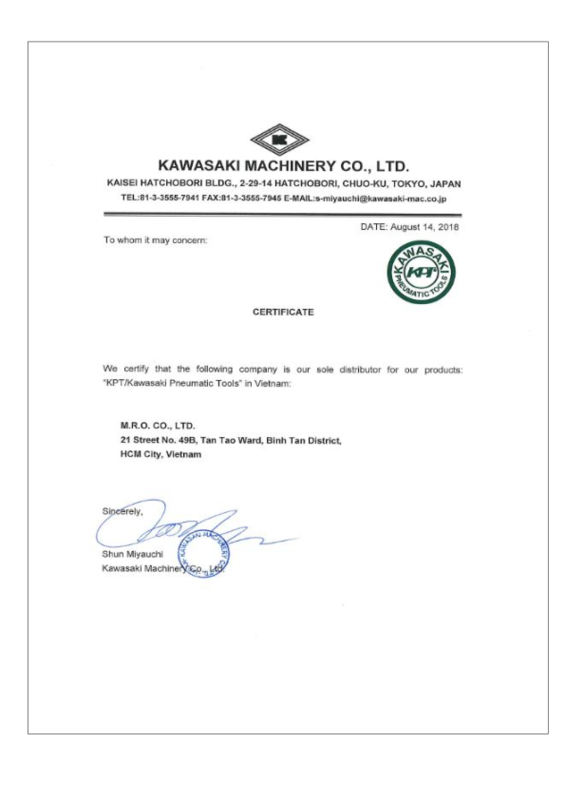 MRO is proud to be the Sole Distributor of Kawasaki Machinery in Vietnam since 2005. Ever since the foundation of the company in 1969, Kawasaki Machinery Co., Ltd has been supplying “KPT/KAWASAKI” Pneumatic Tools to all over the world for more than 40 years. All the tools are made in Japan, using quality materials by skilled workers under strict quality control. Kawasaki always try to improve the quality of the products, adopting new technology to keep quality and competitive price. More than 200 models are lined up meet every requirement of users in various industries, such as automotive aftermarket, construction, manufacturing, wood working as well as other industry. Most of the model are in stock at our warehouse near the bay of Tokyo for prompt delivery. Kawasaki provides spare parts for repair through local agent and distributor for after-services.